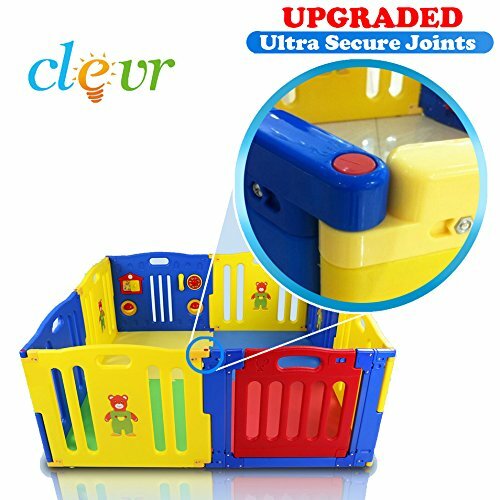 The newly improved ClevrTM Safety 8 Panel Kids Baby Play-Pen Play Yard Pen Indoor Outdoor Home Center Pit patented joint system allows for greater safety and stability. ClevrTM is the only one on the market to utilize these safety joints, which makes our playpen the safest of its kind. The ultra safe joints keeps your child from being able to move the pieces, preventing them from potentially serious injury. Why risk your children's safety on inferior playpens? The ClevrTM Safety Playpen is an eight (8) hinged-panel system to keep your little one safe! Safely Playpen includes six (6) hinged panels, one (1) activity panel with a picture house, ball spinners, play telephone and one (1) swinging door gate with safety lock. You can build it in a variety of shapes such as an octagon, rectangle, or square or you can add/remove panels to make it as big or as small as you like! And with the CleverTM brand, you know you're buying a quality product you can trust. Expandable as big as you need. Extra connectors and walls sold separately. Fully assembled dimensions: 73" in diameter, panels: 31" W x 23.5" H.
The 8-Panel play yard comes with new & improved ultra Safe Joints! Swinging hinged doors, and safety lock on doors. Designed in the mentality of safety first. Includes 8-Panels with the dimensions of 31" W x 23.5" for each panel. Fully assembled dimensions are 73" in Diameter! The Play pit is suitable for all toddlers and babies! Premium Quality product from the ClevrTM Brand. beware of cheap imitations! If the box doesn't say Clevr on it return it for a 100% money back refund! The seller WILL pay for the shipping back!!! If you have any questions about this product by Clevr, contact us by completing and submitting the form below. If you are looking for a specif part number, please include it with your message.